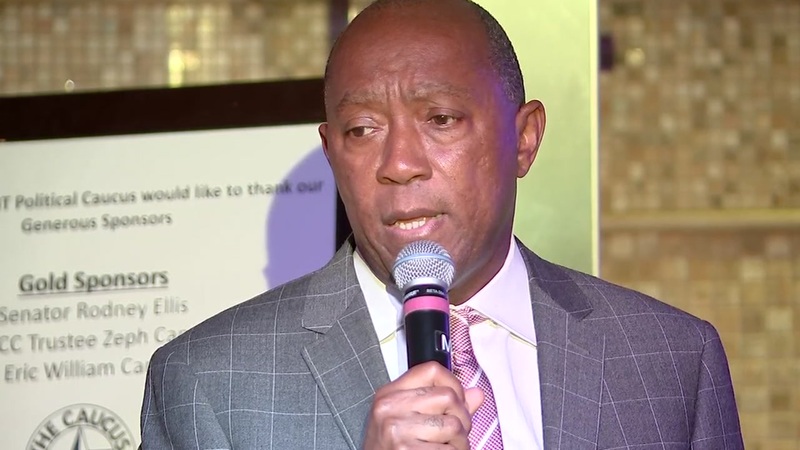 HOUSTON (KTRK) -- Mayor Sylvester Turner and his daughter Ashley hosted free viewings of the award-winning movie "Hidden Figures" for nearly 3,000 students from area school districts over the last two weeks. The film's plot focuses on female African-American mathematicians at NASA, specifically Katherine Johnson, who calculated flight trajectories for Project Mercury and the 1969 Apollo 11 flight to the moon. "We couldn't think of a better way to celebrate Black History Month than to expose students to the story of Katherine Johnson and her pivotal role in American history," said Mayor Turner. "I hope the students learned that no matter their environment, if they stay focused and push forward, they can do something as amazing and transformative as sending a man or woman into space." Students were treated not only to a free screening, but also had popcorn, drinks and a snack and they walked the red carpet. The tickets were donated by African American business leaders who partnered with Fandango for special viewings across the country. In Houston, sponsors included the American Express CEO Kenneth Chenault, former Major League Baseball executive Jimmie Lee Solomon, New York investment bankers Bill Lewis and Charles Phillips, Horizon Group International Vice President Al Kashani, I'm Ready Productions CEO Je'Caryous Johnson and Martye Kendrick of Johnson Petrov.